As someone who just spent the weekend enjoying autumn in NY, I gotta say, who doesn’t love a good novel about changing leaf colors and rustic pumpkin patches? 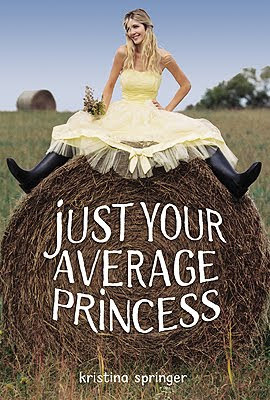 If either of these things makes you want to curl up with a steaming pumpkin spice latte, then check out GCC Member Kristina Springer’s new novel, JUST YOUR AVERAGE PRINCESS out this week through FSG. Isn’t the cover adorable? Kristina: Well, it wasn’t funny, ha ha, but it was my funnest trip anyway—when I was 18 two girlfriends and I drove to Michigan for the weekend and made many pit stops along the way to pose with any and everything (plastic cows, Paul Bunyan etc.) and dance in the middle of streets. Kristina: Not at all. I didn’t figure it out until my late twenties. When I was little I wanted to be a rock star. In college I wanted to be a nurse and then switched to English Education with the intent to teach high school English. Kristina: I had a big slumber party. My mom let me invite like a dozen girls over. It was a lot of fun. Kristina: Same here. My first book was organic and then after that I outlined and wrote synopsis to show my editor before diving into the writing. Kristina: It’s my third book so not too big of a story. ☺ I was checking e-mail and I got a note from my agent that my editor was buying the new book. Thank you, Kristina! Now, everyone go out and buy books, lots and lots of books!